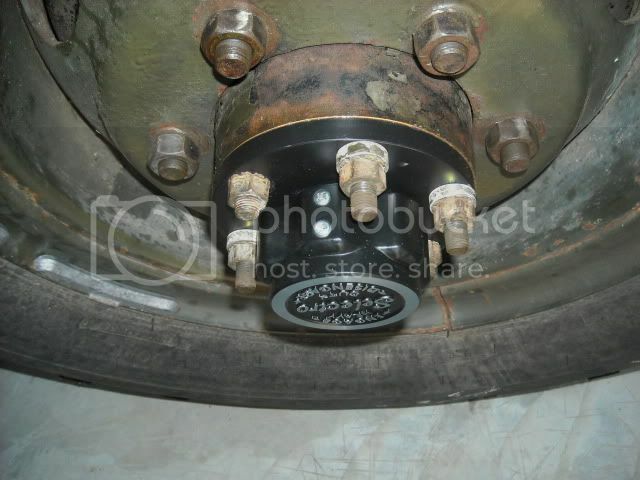 Here's the photo of the hubs installed with the studs. Not too user-friendly. When I did mine I replaced all the studs with a shorter version. Much more driver-friendly. Where do you find selectro hubs? It would be nice since my rig will be on-road more than off. you can find them almost anywhere, Can't remember the part number, but a Google search should bring up multiple sites you can buy them from. I've seen them on Ebay for around $275-295. Planning on getting some in spring 2016, one of many 'to do' items. I put selectro hubs on my 715 and i immediately broke them. I made a machined socket that fit over the outer hub so i wouldnt have any trouble grabbing and turning the hub. mind you i did not shorten the stock studs. well the socket tool works great but it broke the stock plastic cam inside the hub because it spun the cam because the PLASTIC cam is barely retained by the 3 screws that hold it inside. so I took them apart and made cnc machined metal cams. and I remade the screw studs that hold the cam. I also remade the screw studs that hold the hand hub onto the base plate. the 3 studs just engage the groove in the base plate. they were super sloppy in the groove so i made them tighter fit in the groove. with the new metal cams. new retaining screws and the hand tool socket I can crank the hub lock to unlock with very positive action and no slop, and no fear of breaking anything. it was a bit of work but worth it. Ill try and get some pics.